As my regular readers would be aware, I spend many hours, days and weeks writing blog posts to give you sets of rules to work with to find out what works for your unique body and all its glorious features. Many may think that I’m obsessed with rules and believe that we should all stick to them. But, that said, I’m a firm believer in knowing when and how to break all your style rules. Knowing your rules helps you make considered choices when breaking them. I’ve got plenty of photos from my pre-image consultant days of myself wearing clothes that break my rules in a pretty unflattering way (had I known any better at the time). Now when I break my rules, I do so with an understanding of what I’m doing, maybe I look boobier, or hippier than I might in other outfits, but it’s a choice I’m making, rather than an accident. I know I’m having fun and being more creative dressing, rather than just dressing to a formula. I like options and wearing a uniform is an anathema to me. Even if the uniform is one of my own making. I’m an ‘options’ person. I like variety in my wardrobe (which is why I don’t want a small capsule wardrobe, but for some people it’s brilliant). Style rules are just a guide, nothing more. They don’t have to create a uniform (unless that is what you’re after, and then they are a wonderful guide to do that). Being aware that you can play with clothes and express your personality is way more important to me than sticking rigidly to rules. When you look at stylish figures such as Iris Apfel, Carine Roitfeld, Jane Birkin or a plethora of other wonderful women, there will be many so called rules they are breaking, but it doesn’t matter, because they are dressing authentically to express themselves. Understanding my colouring, body shape, proportions and variations really speeds up the shopping process. I’m not going to have to look at all the clothes in the store, I’m aware of what really doesn’t work so I don’t have such horrible change room experiences that when I put them on my body, think to myself how hideous they look on me (or how much I wish I had a waist, which is never going to happen). It allows me to quickly peruse a store, find the few garments that may work on me in a way that makes me happy, it saves me lots of time when shopping. But I’m also open to trying new shapes and styles when they arise in fashion, or finding the version of a fashion trend that will work for me (rather than trying to make me work the trend). I love teaching my clients their rules, then showing them that they can break them, particularly when they’re breaking them as an act of self-expression. How can you break the rules? I adapt fashion to me, to become my style, have fun and enjoy the process that we have to do every day, that is, get dressed. I get bored! I like to mix it up. I like to rest things, then bring them out again. I don’t believe there is anything wrong with this! Because I’m a plump, aged, 5’2″, autumnal, hourglass, thick legged person, I have to break a lot of rules of necessity. But I am an artist. I was wondering about the rule on only 1 voluminous garment at a time. I like the multi-layered, voluminous look of the short Gudren Sjoden but it breaks every rule for a short round woman (or does it?). What do you think? As an artist, you are creative, and get to break all the rules you like Paula! This is definitely a look for artists (not for the corporate lawyer!). Gudren Sjoden does break the rules, but then that is the style of the clothing. I wholeheartedly agree with you. I love warm and cool colors together – orange and blue, cool pink and brown, soft lime green and navy. I know the warm colors aren’t the best on me, but I don’t care. These combos make me so happy that I am sure this is reflected in my face and body language. I feel I look better because these are my happy colors! I have learned more from Imogen about how to dress in a flattering manner for me…than from anyone else. I am still trying to build a wardrobe that flatters me…that said, I give myself permission to wear things that aren’t especially flattering because I like them and can’t afford to wear the perfect wardrobe right this minute. I do fine joy thought in the new pieces I am buying and have received more compliments now…. (I am in my mid fifties) than I did when I was young…and I was a model then. I like having rules and knowing them and working toward building the solutions for me and my figure. But I like giving myself permission to break the rules when I can’t find that perfect combo etc. There is not such thing as perfect! And it’s way harder to dress well when you’re older than when you were a young model with an easy body to dress. It always amazes me when I see an Oprah closet where she’s getting rid of so much clothing, that someone with that kind of money still makes so many expensive mistakes, when she can have anything she wants, tailored to fit her perfectly and have great assistance to choose. It shows you that style is NOT about money! I break rules, sometimes I did not know there was a rule. Then the rules change from time to time so it can be hard to keep up. I am with Anne on wearing orange and blue together, I like the colour combination eg denim with orange top. I think that is high contrast and I am suppose to be low contrast, so depending on shades of denim and orange I wear it anyway. Fashion rules do change over the years – though younger readers may not realise this! It used to be smart to wear matching shoes and bags, as an example, though current advice suggests that it can look dated. Being 5′ and a bit, I know that vertical lines will make me look taller and slimmer, however I have lots of horizontal stripes in my wardrobe. This is one rule for petites that I’m happy to break as it’s part of my signature look. Ive always been someonebody who breaks the rules, but they are great for people who don’t what direction with their closet they want to go and then when they gain more experience, adapt to their own perspective of things. Thats what Im doing – I read the “rules” and listening to opinions and then altered them to make them suit me better. 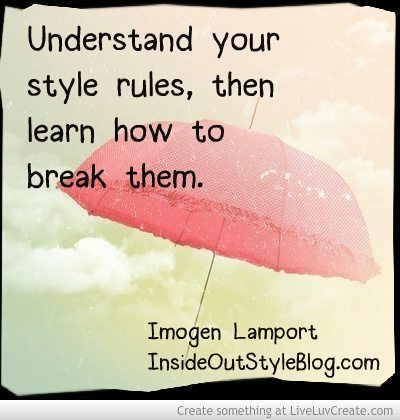 So personally, I only see the rules many stylist, consulates and fashionista claim that you “must” follow as GUIDELINES. 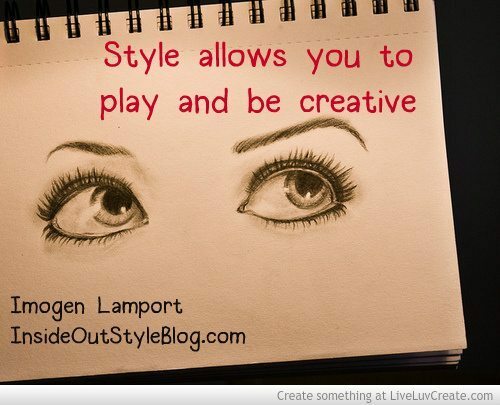 My only issue is how incorporate you personal style with the occasion or the surrounding. I want to dress more corporate (or classic elegant), but feel most comfortable in Feminine and soft-looking garments (feminine in fabric, print and texture – not short hemlines/low necklines) with edgy statement jewelry and always hesitate to dress after my personal style because I want to be taken seriously as well. Ive never been working in a office (going to work in fast fashion-retail store – H&M/Forever 21 kinds) so its hard to look how other women dress at those occasions. Because of this, I avoid wearing some of my clothes that I acually LOVE, because I hate being treated badly because of my clothes. I wasnt even wearing any extreme, but still get bad reactions (-.- just because you wear bright eyeshadow when wearing jeans and t-shirt or dress more feminine doesnt mean you want have to laid… LOL). As a petite gal, I know I’m “supposed” to wear heels. No, no, no. Well, maybe at gunpoint. I will not mess up the arch of my foot ‘cos it interferes with my marital arts training. Then of course, I’m always pairing colours like green and blue, navy and black, brown and black. I don’t wear makeup and love very structured androgynous garments – things with collars and straight lines. It probably makes me look older than I am. I don’t think anyone has been injured by my fashion misdemeanours so far. “martial arts”, not “marital arts”.